LinkedIn Jobs now working even harder for you - job matches now sent to you via email. A few weeks ago I posted to this blog with information on how LinkedIn Job listings work harder than those on other job sites. Last week we released a new enhancement to LinkedIn Jobs to make it work even harder. 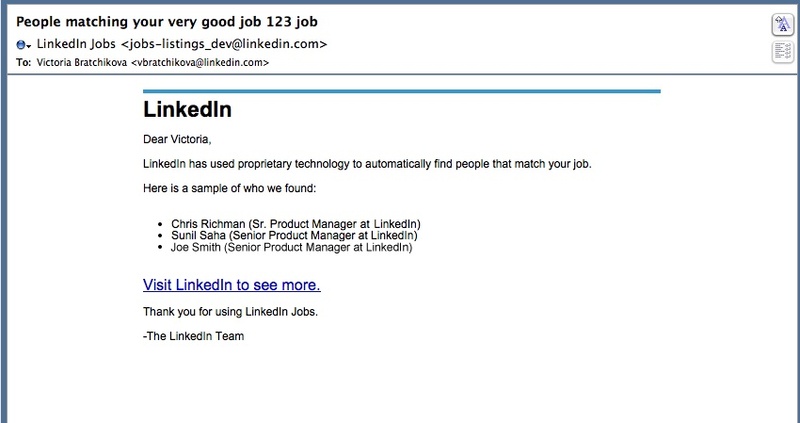 You will now receive an email notification when we find people that match your open job listings. We only send one notification per job so as not to bombard you. When you receive an email notification, click the "Visit LinkedIn to see more" link within the email to see your matches. Take a look at the matches and feel free to send us feedback. The feedback link is on the page with all of your matches (not within the email itself). We will use your feedback to improve the matching algorithm. For more information on LinkedIn Jobs click here.